The Congress Party on Tuesday said there is no existing rule stating that a state cannot have its own flag and accused the Bharatiya Janata Party (BJP) of being 'Hindi-Centric' and not respecting diversity. 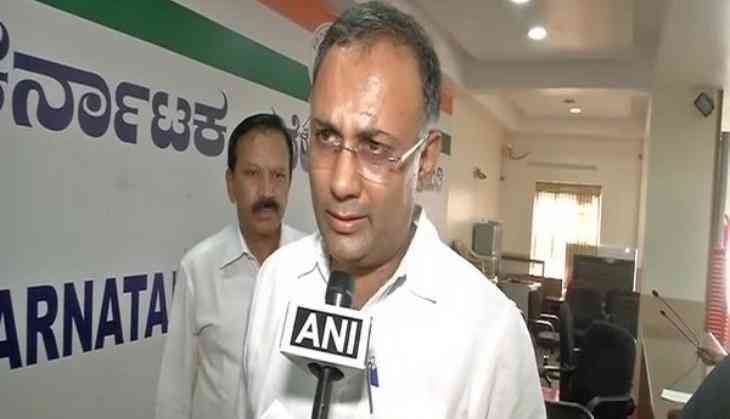 Slamming the Centre for terming the Karnataka government's decision of having a state flag as a political gimmick, Congress leader Dinesh Gundu Rao told ANI that the BJP wants to have a "uniform" kind of a country. "The opposition which comes from BJP, they are Hindi-Centric and they want to have a uniform kind of a country, they don't trust other people, they do not respect diversity," he added. He further said that just because Karnataka wants to have a state flag , that does not mean it has no respect the national flag. Earlier, after Congress leader Shashi Tharoor said he has no objection to states having their own flags, the BJP called on party President Sonia Gandhi to make her stand clear on the same. "Sonia Gandhi must speak up her position on the issue. They ( Congress) cannot take one position in Bengaluru and other New Delhi. We will not allow them to pursue this hypocrisy," BJP leader G. V. L. Narasimha Rao told ANI. Rao said Chief Minister Siddaramaiah has failed on all fronts of Governance and having misgoverned for four and a half years, he is now diverting public attention from his misgovernance. "His misgovernance is simply not going to go away despite his best effort. People of Karnataka will hand a resounding defeat to him at a time when elections are held," he said. On July 18, the Karnataka Government constituted a nine-member committee to submit a report to the state government on the possibility of designing a separate flag for the state. The Committee was constituted after a representation was submitted to the state government by Journalist-writer and president of Karnataka Vidyavardhaka Sangha, Dharward, Patil Puttappa and social worker Bheemappa Gundappa Gadada. They had urged the government to design a separate flag for Kannada 'naadu' and accord statutory standing for that. Karnataka Chief Minister Siddaramaiah has defended the demand for a separate flag for the state, asking if there is any provision in the Constitution that prohibits the state from having its own flag. "Is there any provision in the Constitution that prohibits a state to have its own flag? Did BJP people come across any provision?" Siddaramaiah said.